I must’ve hit Santa’s good list, because this year’s crop of holiday jazz is quite impressive. And the best news: Straight-ahead jazz is reclaiming the throne co-opted by elevator music. As a result of two trends in the 1980s and ’90s — the success of Windham Hill’s signature sound, and the revival of lounge music — “jazz” was transmogrified into an all-encompassing designation that included everything from monotonous synth slush to puerile E-Z listening schlock. Every half-baked solo instrumentalist (most often a sax player) with access to a computer cranked out monotonous covers of the usual suspects — “Jingle Bells,” “The Christmas Song” and “Silent Night” among the worst offenders — that were virtually indistinguishable. And no wonder: The programmed “fill” and percussion sections were an infantile insult to true musicians. On the positive side, the Internet has turned my annual search into a true treasure hunt, since imagination is required to track down the offerings from micro-labels. Mind you, “homemade” isn’t necessarily a pejorative these days; CD technology has turned living rooms into high-tech recording studios, and Web sites provide the best in free advertising to the entire world. The Web’s streaming radio networks can be quite useful (although registration might be required). Two of the largest — Christmasradio.com and Christmasradionetwork.com — play the sounds of the season 24/7. As-yet undiscovered artists also post their efforts, often as downloadable MP3 files, at Web “collectives” such as CD Baby (www.cdbaby.com), which had hundreds of holiday-themed albums that I’d never before encountered, several of them mentioned below. But be careful: Some of the “artists” you’ll find at CD Baby and its clones deserve to remain undiscovered. Let’s start out with a few carryovers that arrived too late to be included in my 2002 survey. 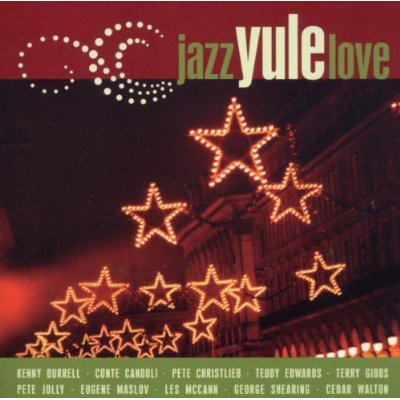 First up is producer Stix Hooper’s Jazz Yule Love (Mack Avenue Records, MAC 1007), a grand anthology of tracks by numerous jazz stars. The album’s standout cuts are a swinging reading of “It’s the Most Wonderful Time of the Year” by the Pete Jolly Trio (Jolly on piano, Chuck Berghoffer on bass, Nick Martinis on drums); and a show-stopping cover of “Angels We Have Heard on High” by the Eugene Maslov Trio (Maslov on piano, Boris Kozlov on bass, Joe LaBarbera on drums). Not everything is up-tempo and fierce. Two of the album’s other high points are solos: tenor saxman Teddy Edwards’ poignant cover of “Silent Night,” and Maslov’s melancholy interpretation of “O Come All Ye Faithful.” The one jarring note comes from Les McCann, who delivers a frankly weird original dubbed “Christmas Heart” (no doubt included because of Hooper’s participation on drums).